An album characterised by floating melodies, given added grace by singer Sylwia Bialas (on ‘Traveller’), and flautist Gareth Lockrane (‘Together’), but mostly held by the seamless blend of the trio. The guitar of Tassos Spiliotopoulos is gorgeous in itself, a refinement of the jazz-rock pyrotechnics of John McLaughlin and Larry Coryell. Yaron Stavi is always superb, providing the anchorage that prevents the drift from aimlessness, but providing plangent countermelodies when he steps up to solo himself. But it’s the drummer/leader who lifts the performance with his astonishing accurate, nuanced rhythm-keeping. Sirkis, in the notes, mentions the ability of melody to connect directly to the soul. 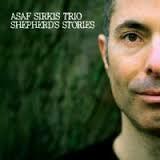 Melodies as luminous as ‘Meditation’ and ‘Shepherd’s Stories’ achieve this aim with quiet, understated brilliance. I don’t think anyone (not in this country at any rate) knows about this genius Chicago-based songwriter. Calhoun is also the label chief of Waterbug Records, which specialises in acoustic roots music. But no-one on Waterbug is as talented as its owner. This is his third album (I think), released on Flying Fish in 1986, and dipping into a songbook that was already quite extensive, with some songs from his teens (he scrupulously dates songs with the year of composition). So this swings between innocence (like the title track, a lyrical evocation of a child’s wonder at horror) and existential angst, deploying a songwriting technique open to free association and primal therapy. In short, he can rant with the best. Simple observation is apt to spiral into full-blown neurosis. ‘Jack and Jill’ is as unhinged and idiosyncratic as anything by Mark E Smith. He is also a master of John Cheever-style glumness, and there’s also no-one like Calhoun for mingling the numinous and quotidian, as on ‘Rye, New Hampshire’. Like I say, a genius. Anyway, no bids at 99p. The auction closes 18:25:41 on Sept 8.